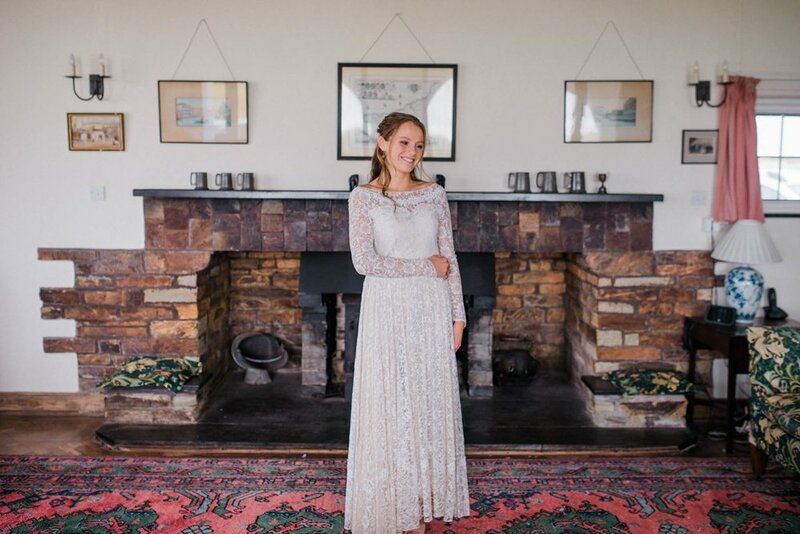 At Poppy Perspective I create bespoke, boho and vintage inspired wedding dresses for the modern bride looking for something a little bit different. I believe your dress should be exactly that, and be as unique, personal and special as you and your wedding day. Every dress is a one off and by working closely with you throughout the design process I create timeless, elegant yet modern pieces that are all about you and all lovingly handmade in my Kent studio. I also love to mix in vintage elements, be that an antique lace trim sourced just for you, or your favourite classic Hollywood silhouette. Most of all I love the fun of building your dream dress from scratch. You're only going to do this once, so let's make this dress count! Bespoke wedding dresses start at £1350. I am so excited to begin work on a collection of one off dresses that will be available to buy online. Featuring the same craftsmanship and materials, and as unique as my bespoke dresses, the collection will be available soon... watch this space! Hi I’m Phiney… Thanks for stopping by! I was born and raised in London but followed my dream of living by the sea two years ago and moved to the beautiful Kent coast. I love being by the sea, the fresh air, long walks and beautiful scenery sparks my creativity! Originally I studied Womenswear design at London College of Fashion and over the last 12 years have gone on to work across all areas of the industry from design and manufacture to styling and photography. I have always had a love of vintage and antique textiles and most recently worked in restoration, but something kept pulling me back to bridal. Poppy Perspective, named after a dear loved one, was born in 2016 when a friend asked me to make her a bespoke dress after an unsuccessful dress hunt and has grown from there. I worked on Poppy Perspective in my spare time over the past two years but am now focusing on bridal design full time and am so excited to see what happens next. View the real bride or look book galleries for inspiration or for more information and to arrange a consultation about your dream dress get in contact, I’d love to hear from you. "Phiney is imaginative, accommodating, and kind. She didn't just fix and alter my 1950's lace wedding dress to size but added quirky and original ideas to the design which meant that it felt completely my own and utterly unique." "I found Phiney after months of trailing around bridal shops and feeling increasingly panicky about finding a dress. I knew what I wanted but couldn't find it in anywhere! She asked lots of questions about what I was looking for and what I liked about certain styles and then advised me on materials and shades to suit my body shape/colouring. We had regular fittings as she made the dress to make sure I was happy each step of the way. She was professional, quick to respond and never phased by my panics/barrage of silly questions but also totally lovely to be around. It is obvious that she has worked in fashion for years, is very technically skilled and has a gift for knowing what will look good on you. I ended up with a stunning wedding dress and would recommend her in a heartbeat for anyone looking for a bespoke wedding dress and a panic free experience."